I have been working with USAID and the Amembassy to try to effect a smooth transition to NRC funding on 1 May. Please keep me in the loop on transition related issues. Following is the answer to’your questions below, and some additional questions from here. (3) allow each traveler to choose their own hotel? It is desired that the team stay at the same hotel (Hotel Okura). It is across the street from the Embassy, and is currently providing the best rate to the government, including breakfast. Need to also decide if CFO desires to have travelers book and pay hotels individually on their orders, or have rooms paid for collectively out of an ICASS line item (which results in a 5% cost reduction but could be a management burden). We are currently using one translator on average about eight hours per day. It occasionally goes to two translators and the hours sometimes go late. USAID said the burn rate has been about $25K/week, so I am trying to streamline the usage. We are now cutting out weekends and hope to reduce elsewhere. – To make it easier on travelers, those returning the first few days of May will still be on USAID travel. They should keep in mind that their return tickets will not be able to be changed. Travelers departing the US next week will be on NRC funding for their entire trip. That way folks arriving/departing around May 1 won’t have to file two separate vouchers. 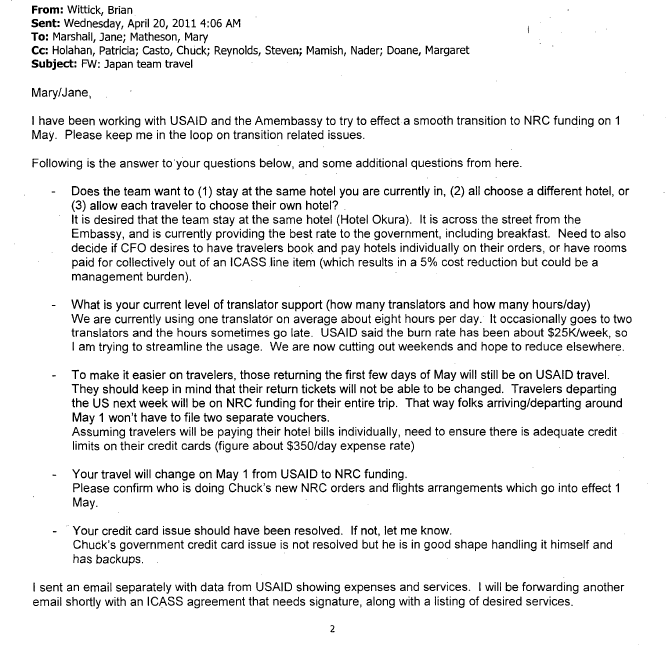 – Your travel will change on May 1 from USAID to NRC funding. Please confirm who is doing Chuck’s new NRC orders and flights arrangements which go into effect 1 May. – Your credit card issue should have been resolved. If not, let me know. Chuck’s government credit card issue is not resolved but he is in good shape handling it himself and has backups. I sent an email separately with data from USAID showing expenses and services. I will be forwarding another email shortly with an ICASS agreement that needs signature, along with a listing of desired services. Also, for more long term planning, if we send someone here for longer periods (>90 days) we need to have travelers complete State medical screenings; for a PCS there are many more requirements, such as completion of NSDD 38 mission staffing process completed. – What is your current level of translator support (how many translators and-how many hours/day)? They should keep in mind that their return tickets will not be able to be changed. Travelers departing the US next week will be on NRC funding for their entire trip. That way folks arriving/departing around May 1 won’t have to file two separate vouchers. 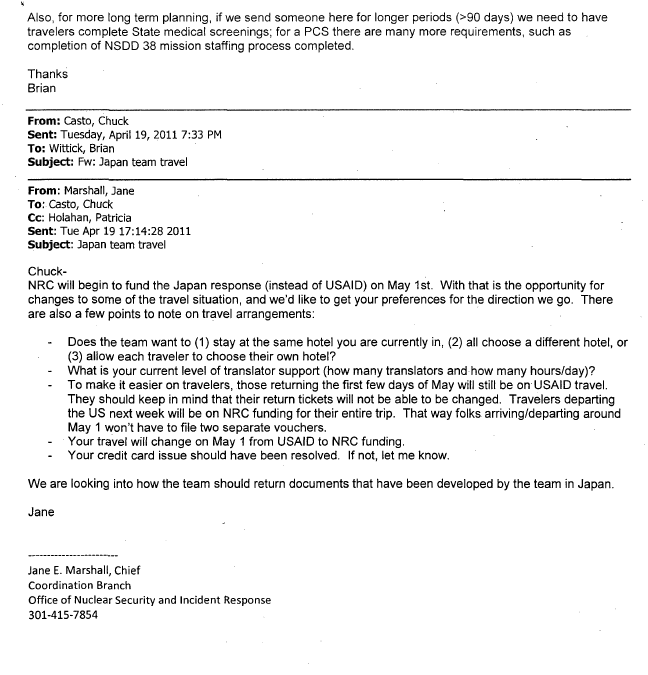 – Your travel will change on May I from USAID to NRC funding. Your credit card issue should have been resolved. If not, let me know. We are looking into how the team should return documents that have been developed by the team in Japan.